Who hasn’t posted anything style related in forever? Don’t worry, I’ve still been maintaining some sense of style during my pregnancy, except for the days when I work from home all day and don’t put on a speck of makeup or anything other than pajamas and workout clothes. One of the ways I’ve tried to keep up with trends without spending a ton of money on maternity clothes is with statement jewelry and pretty bracelets. I’m so over maternity clothes! So when I go shopping, be it online or in the store, I’ve gravitate towards clothes that can be worn now and later (I’m still wearing a lot of non-maternity clothes) and jewelry. I always swoon over all the trendy baubles at J. Crew and Anthropologie.. But. I’m not spending $50+ on jewelry that may or may not be in style in a few months. This is where knock-off jewelry comes in. I have to preface this by saying I’m not a huge fan of designer imposter things usually. I’d rather save my money for the real thing, ask for it as a gift, or buy it gently used from a consignment sale versus purchase something that looks like the real thing, but just isn’t. However, when it comes to jewelry, I feel differently. Jewelry is more about the creative design than a “look” or a copyrighted logo. 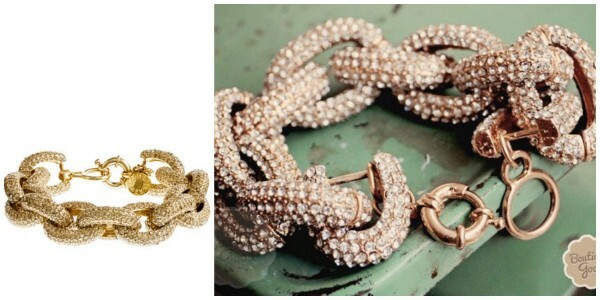 I get tons of compliments on my designer inspired jewelry and I love sharing my sources when people ask me about them. So, of course, I want to share them with you. Here are a few of my favorite J. 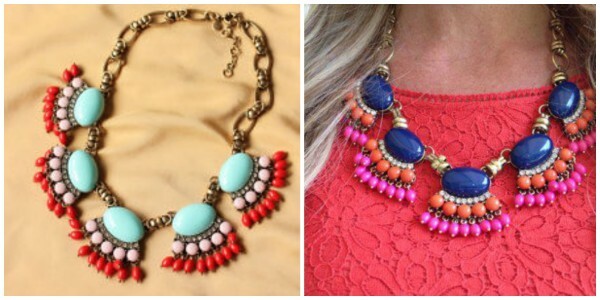 Crew and Anthropologie statement necklaces compared to some knock-offs I’ve found, plus a bracelet I threw in as well. As you can see, this isn’t an exact replica, but I actually like the Groopdealz version better. I own this piece and get compliments on it all the time. I’m really into bracelets right now and have been building my collection with faux baubles like this bracelet on the right, which I’m patiently awaiting right now. This necklace was super popular at J. Crew and has sold out. You can only purchase the real thing online now at Ebay. (It looks like the necklaces are going for about $70.) However, the one on the right is the one I own. Can you tell the difference? Mine is actually identical to the one on the left because Groopdealz offered them in a variety of colors. I’ve wore it once and received no less than three compliments in four hours — one of which came from a J. Crew sales associate. I don’t own the knock-off of this necklace yet, but I’m considering making the purchase. Obviously, they’re a little different, but the difference in price is well worth the small difference in the number of roses (IMO) — the effect is very much the same. 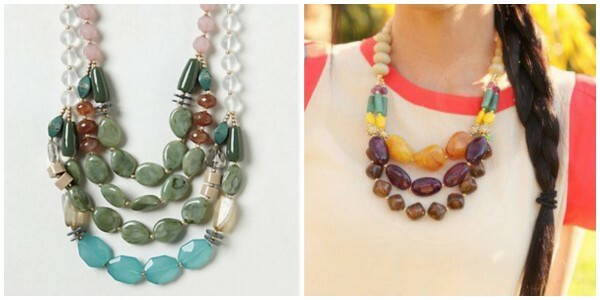 The “save” necklace comes from Bijuju, who currently offers the necklace in green, pink, black, and cream. Note: I’m obviously in love with Groopdealz and it should be noted that I’ve never seen a necklace more than $20 from them. They work a little differently than a regular online store because deals are only good until they run out of a product (which is fast — like 2 days). Also, in my experience it takes a good month or more to receive your order. I often forget what I’ve ordered, so it’s a nice surprise when a pretty sparkly thing shows up on my doorstep. 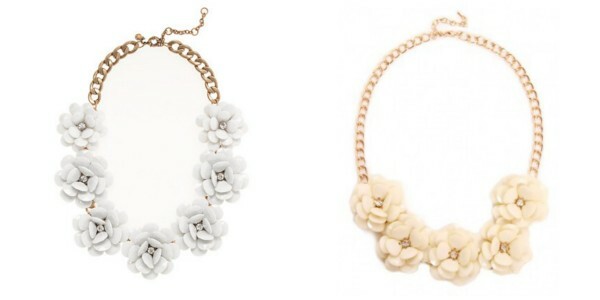 Looking for more affordable gorgeous statement necklaces and trendy bracelets? This list of online store should keep you busy. I am so with you- other than my wedding to rings and two three pairs of “real” earrings, I’m all about Forever 21, Old Navy, Charming Charlie’s, and even Target. And I’d say about 75% lasts at least a year, which is definitely not bad. have you tired veryjane.com? they have tons of cute stuff too. I haven’t! Thanks for the suggestion. I’ll have to check it out!